Figure 1: Eiffel Tower, Anonymous View of the Tower, 1889, photograph. In 1890, the year after the Eiffel Tower opened as the centerpiece of the Paris Exposition Universelle, writer Henri Girard declared, in a small volume dedicated to La Tour Eiffel de Trois Cent Métres, that its designer, Gustave Eiffel, had become “the object of general envy” amongst the denizens of Paris [Fig.1]. This envy, according to Girard, was inspired not by the fame that had accrued upon its designer, or the fortune the tower generated but, rather, from a single design feature he had built into the plan. Eiffel had installed a private apartment at the summit of his colossal tower to which he alone had access. It is tempting to situate this pied à terre in the realm of the domestic. Viewed from this perspective, one can understand the Eiffel apartment as an iteration of domesticity antithetical to the normative space of his other residences: an estate in the French countryside and a massive stone hôtel particulier on the Rue Rabelais in Paris replete with French historicist furniture, chandeliers, objets d’art, paintings, and other signifiers of upper-class domesticity in the late nineteenth century. The Eiffel Tower was at the epicenter of a constellation of dreams: of technological progress, modernity, and national prestige. Indeed the metaphor of the dream might provide a more appropriate approach to interpreting such an irrational space. What dreams, motivations and aspirations inspired Eiffel to build his tower-top apartment in the first place? And, drawing inspiration from Benjamin’s assertion that “not architecture alone, but all technology, is at certain stages, evidence of a collective dream,” we can inquire as to what the top of the tower can tell us about the collective dreams of the culture more broadly. Considering such questions is the project of this essay. I argue that it was the twinned dreams of exploration and mastery of the wind which held Eiffel in their thrall and that these dreams were perfectly encapsulated in the idea of flight. The small apartment with its peculiar fairground address and its adjacent tower laboratories can be read as potent iteration of his aeronautic and exploratory ambitions. These ambitions, moreover, were shared by French society more broadly. Seen through this lens, the tower reveals itself as both theater of experiment and experimental object collapsed into one, with conditions of flight a central object of investigation. Like a spectacular airship for one permanently perched in the sky, the top of the tower seemed poised for an exploratory adventure like the “space bullet” aimed at the moon in a Jules Verne adventure. But at the same time, it was also a living laboratory, a theater of experiment in a network of experimental sites for Eiffel’s many investigations of the wind. An examination of this space permits us to understand how experimentation and exploration, scientific work and spectacle, were entangled in the late nineteenth-century popular imagination. Might not the prospect of the exploration of foreign lands and, moreover, the mechanisms of modern travel which permitted such exploration also fit into this schema, articulating this modern desire to be somewhere other than here? That the taste for such adventure permeated the culture is evident in, for example, the popularity of travel literature, the diversions offered by panoramas depicting exotic lands, or the science-fiction fantasies of Jules Verne. The explosion of new travel technologies over the course of the nineteenth century—the steam locomotive, steamer ship, and air balloon among others—also fueled these fantasies. Could Eiffel’s tower have participated in giving expression, in some fragmentary, subconscious way, to these cultural proclivities? In 1890, for example, the same year Girard published his description of the adventures to be had in Eiffel’s dream apartment, the popular journal L’Illustration ran a brief article featuring images of another adventure: a planned expedition to the Antarctic. Such expeditions frequently attracted considerable public interest throughout the nineteenth-century, both in Europe and abroad and accounts frequently appeared in the popular press. Here the mode of travel may have been of particular interest. Although there had been a long series of Arctic expeditions in the nineteenth century, many of which ended in catastrophe and failure, they typically commenced with lengthy voyages by ship. 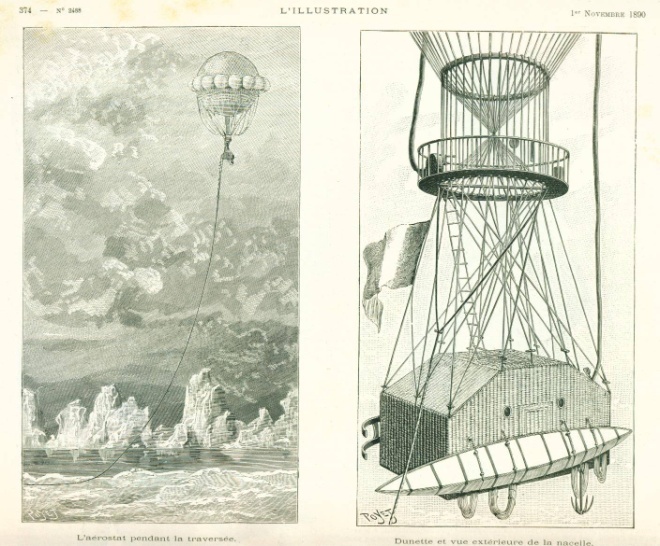 What the images in L’Illustration captured, however, was an attempt to explore the arctic by means of a relatively novel technology, the hot air balloon, a detail that might have fueled even greater interest in the expedition. The fantasy of flight offered by modern air balloons and the attempt to construct steerable airships, called dirigibles, were also objects of great cultural fascination in the period before motorized air travel became possible [Fig. 2]. Interest was fueled by publications such as Gaston Tissandier’s Histoire de mes ascensions or Jules Vernes’ Cinq Semaines en Ballon, a fictional account of an African exploration via hot air balloon. In addition to giving the overall aspect of the balloon and its attached riggings and equipment, the artist who illustrated the piece in L’Illusration paid particular attention to visually rendering the well-fitted and compact cabin of the explorers [Figs. 2-3]. This was the interior space where, with a bare minimum of equipment and provisions, the intrepid explorers would maintain life under unimaginable atmospheric conditions: able to eat, rest, and conduct scientific experiments while slowly floating towards Antarctica. Figure 4: Cross section view of Otis Elevator on the Eiffel Tower, La Nature, May 4, 1889, volume 17, p. 360. …all the sensations of a long sea-voyage without ever leaving home; the pleasure of moving from place to place, a pleasure which in fact exists only in recollection of the past and hardly ever in experience of the present… the imagination could provide a….substitute for the vulgar reality of actual experience. However, unlike Des Esseinte’s illusory space replicating a ship’s cabin, the Eiffel tower’s chambers created an illusion of something entirely new and unfamiliar: a kind of flight through perfect space. Like the “space bullet” enabling travel to the moon in Jules Verne’s De la Terre à la Lune, it referenced a modern fantasy that had yet been iterated. Dreams of flight and aeronautic adventure were, perhaps, not new. What was new was the dream of an infinitely progressing science capable of calculating the path to such dreams. I have argued thus far that the Eiffel Tower concentrated, constructed, and gave form to a cultural fantasy of travel, exploration, and as-yet-impossible forms of flight. It can equally be said to have given form to another dream domain of exploration in nineteenth-century culture: science. Not only was the tower symbolically envisioned as a paean to the scientific era, an “arc de triomphe of science and industry,” according to one contemporary commentator but, even before it was erected, the tower had been conceived of by Eiffel as a kind of 300-meter high laboratory. In an era during which scientific discoveries in the laboratory were reordering society on multiple levels, the dream space of the laboratory held a seductive appeal. There, the exploratory impulse, writ large in such adventurous undertakings as Arctic expeditions, was expressed on a microcosmic scale. Historians have observed that the nineteenth-century laboratory was a locus of knowledge production and a place where one witnessed the phenomenon of “the staging of nature as spectacle.” Not only was the Eiffel Tower outfitted with three laboratories adjacent to the tower-top apartment, where such activities would take place, the Eiffel Tower itself was utilized by Eiffel as an enormous technological device—an experimental object designed in part to, in Latour’s words, “invert the hierarchies of forces” by testing and enabling the exploration of the fundamental principles of aerodynamics. It is no mere lark that the tower became a kind of magnet for would-be scientific experimenters. The intensely public nature of the space, and the access it provided to extraordinary heights made it a particularly dynamic theater of experiment. There were the daredevil experiments, which attracted the attention of the popular press—such as the unauthorized 1912 parachute test by the French tailor Franz Reichelt that ended in his death—but also, and more frequently, much more sober scientific investigations were conducted in Eiffel’s tower laboratories into telegraphic communication, radio transmissions, Foucault’s pendulum, meteorology, and the mercury manometer. Eiffel had always intended for the tower to serve as an epicenter for scientific inquiry. Indeed it was dominant in his initial justifications of the scheme. In an address delivered at a professional meeting before the tower’s completion, Eiffel enumerated the many ways the tower was a perfect instrument for scientific observation (meteorological and astronomical) and experimentation on such diverse subjects as “the falling of bodies through the air, the resistance of the air at various velocities, certain laws of elasticity, [and] the study of the compression of gas or vapors.” The tower, when completed, was eventually used for all of these purposes, which Eiffel eventually documented in a publication entitled Travaux scientifiques exécutés à la tour de 300 mètres de 1889 à 1900. In a sense, the tower bears some affinity with another sensational project of 1891 with which Eiffel was involved. At the behest of his astronomer friend Pierre Janssen, Eiffel attempted to install an observatory and living space atop Mont Blanc that would enable Janssen to observe phenomena which he declared “are the most subject to interference by artificial light and atmospheric absorption at lower positions, for example the study of the planets… the telluric spectrum and the normal solar spectrum, and finally, meteorological and physiological observations.” An observatory at such a height would, in short, make observation of space easier than from lower ground. However, given the icy conditions of Mont Blanc, Eiffel was unable to complete the project. The claim that unique atmospheric conditions were available at the uppermost reaches of the tower mirrored Janssen’s claims that unique atmospheric conditions were available at the top of the mountain. The critical difference is merely that while Mont Blanc was a natural formation, the Eiffel Tower was man-made technology. This distinction, however obvious, brings the tower more in line with that of the specialized laboratory instrument or experimental object: it was a massive technology for collecting data about meteorological effects, wind directions, and air resistance, at 1,000 feet. Eiffel became somewhat fixated exclusively on investigating these issues, transforming the tower into a giant apparatus for experimentation [Fig. 5]. In 1907, he published the results of his experiments involving dropping various objects from points on the tower in a tome entitled, Recherches expérimentales sur la résistance de l'air exécutées à la tour Eiffel. It is possible that Eiffel conceived of the tower-top laboratories as the initiatory site for a network of personal laboratories and theaters for experiment. Not only did instruments installed all over the crown of the tower transmit data to a meteorological laboratory on the ground, but Eiffel went on to install, in quick succession, weather stations in the towns of Sèvres (in his familial home), Beaulieu, Vacquet, and Ploumanach. 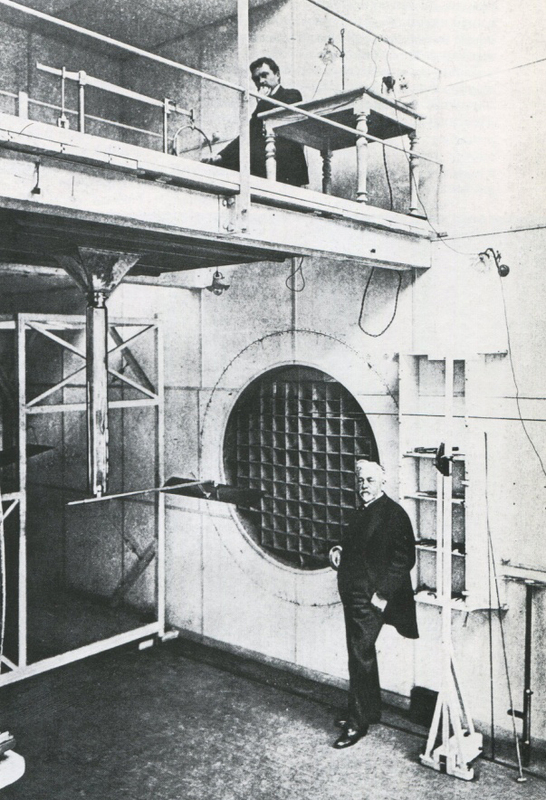 Figure 6: Gustave Eiffel in the experimental chamber of his aerodynamic laboratory, photogravure, reproduced in Loyrette, Gustave Eiffel, p. 209. It was his passionate interest in wind, air resistance, and aviation however, which engaged him almost exclusively in scientific pursuits from the early 1900s onward. Wind, of course, had always been central to Eiffel’s work as an engineer of bridges, towers, and other massive structures. The very structure of the tower itself was a powerful testament to Eiffel’s sophisticated understanding of the principles of wind-resistance. There was, in 300 meters of iron lattice-work, very little surface for the wind to grab hold of. By the early twentieth century, Eiffel had earned a reputation as a pioneer of aeronautical studies. His work culminated in numerous publications of importance to the field, including the 1910 volume The Resistance of the Air and Aviation: Experiments carried out at the Champ de Mars laboratory. In 1913, the Smithsonian Institution in America awarded Eiffel the second ever Langley Prize for aviation research (the first had gone to the Wright Brothers). In his presentation address, Alexander Graham Bell observed that Eiffel had at last given engineers “the data for designing and constructing flying machines upon sound scientific principles.” To paraphrase Victor Hugo, Eiffel had given calculus to the dream: the dream of flight. Figure 7: Alberto Santos –Dumont circling the Eiffel Tower. Reproduced in Gustave Eiffel, La tour Eiffel en 1900, p. 263. 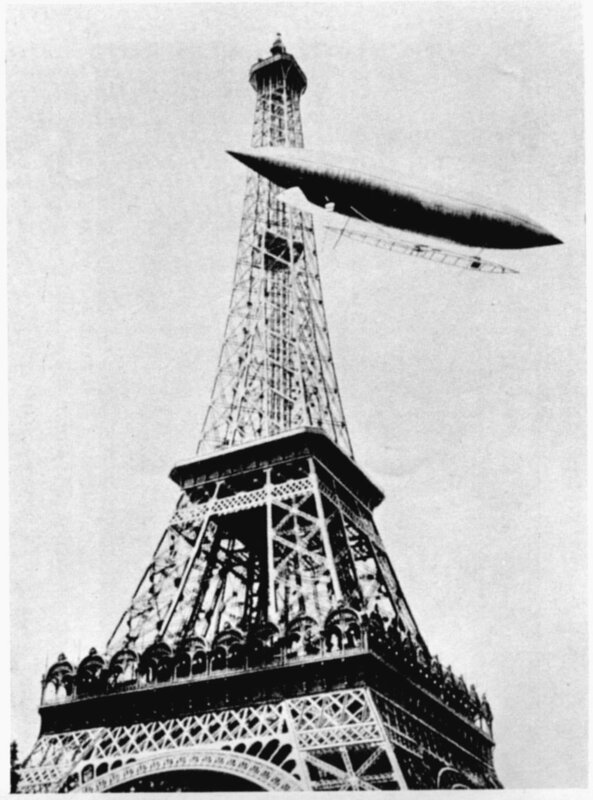 If we take the metaphor of the tour as a ship immersed in deep space but bereft of a sea, and add to it Eiffel’s lifelong fascination with the wind and the air, I want to propose a reading of the Eiffel Tower as a kind of airship. In this sense, I think that we can read Eiffel’s little eyrie at the top of the Tower as less a “pied à terre” and more as a “pied en l’air”: a suspended cabin in this fantasized airship. Protected and private, it allowed the inhabitant to go head-to-head with his greatest enemy and his greatest object of fascination: the wind. Ultimately, the realization of actual flight evaded Eiffel personally. His fascination with aerodynamics, however, directly contributed to the development of technology which enabled the earliest iterations of air travel. And his tower became incidentally linked to one of the breakthrough moments in aeronautics. In 1901, Brazilian-born aeronaut Alberto Santos-Dumont successfully circled around the apex of the Tower with the first motor-powered dirigible airship [Fig. 7]. The real airship twinned the fantasy airship and, in so doing, perhaps inspired Eiffel to pursue his aerial ambitions with even greater fervor. Through metaphor and experiment, metal towers and meticulous observation, Eiffel did, in some measure, achieve the mastery of wind he desired. And the cabin he built at the top of the tower, the dream apartment that was “both house and stars,” was, if not the cockpit of an actual flying machine, at the very least, a critical launching point for realizing a cultural dream of flight. Jules Verne, From the Earth to the Moon, New York: Scribner, Armstrong & Co., 1874, 169. Citation is quoted in Walter Benjamin, The Arcades Project, Cambridge, MA, Harvard University Press, 1999, 227: “Baudelaire in the introduction to his translation of Poe’s “Philosophy of Furniture,” which originally appeared in October 1852 in Le Magasin des familles…. Reproduced later in Charles Baudelaire, Oeuvres completes, ed. Crépet, Histoires Grotesques et Sérieuses par Poe, Paris, 1937, 304. Henri Girard, La Tour Eiffel de Trois Cent Métres, Firmin-Diot et Cie: Paris, 1891, 91-95, 104-106, 110-111 reproduced in Philip Denis Cate, ed., The Eiffel Tower, A Tour de Force: Its Centennial Exhibition: April 19-June 3, 1989, The Grolier Club, New York, July 6-September 3, 1989, The Mona Bismarck Foundation, Paris, New York: Grolier Club, 1989, 57. Girard, La Tour Eiffel, 91-95, 104-106, 110-111. Emphasis added by author. Ibid., Emphasis added by author. Benjamin, The Arcades Project, 152. Stephen Bann, Romanticism and the Rise of History, New York, Toronto: Twayne Publishers; Maxwell Macmillan Canada, Maxwell Macmillan International, 1995, 103. Guy Tomel, “Voyage au Pôle Nord en Ballon,” L’Illustration, November 1, 1890, 374-376. For a famous failed attempt to reach the Arctic via hot air balloon, see Alec Wilkinson, The Ice Balloon: S. A. Andrée and the Heroic Age of Arctic Exploration, New York: Vintage Books, 2012. Gaston Tissandier, Histoire de mes ascensions récit de quarante aériens (1868-1886), Paris, Maurice Dreyfous, 1882. Jules Verne, Cinq Semaines en Ballon: un roman, J. Hetzel et cie, Paris, 1863. Verne, From the Earth to the Moon, 169. Joseph Harriss, The Tallest Tower, Bloomington, In: Unlimited Publishing, 2004, 82, referring to an article in Le Temps from March 1889. Hughes le Roux, “Une Ascension de la Tour Eiffel,” L’Exposition de Paris, No. 8, April 1, 1889, reproduced in Philip Denis Cate, ed., The Eiffel Tower, A Tour de Force: Its Centennial Exhibition: April 19-June 3, 1989, The Grolier Club, New York, July 6-September 3, 1989, The Mona Bismarck Foundation, Paris, New York: Grolier Club, 1989, 43. Emile Goudeau, “Ascension à la tour Eiffel,” Revue de l’Exposition Universelle de 1889, vol. 1, Paris, 1889, 285 quoted in Henri Loyrette, Gustave Eiffel, New York: Rizzoli, 1985, 155. Richard Kaufman, Paris of To-day, trans. from Danish by Olga Flinch, New York: Cassel, 1891, 287-292 (originally published as Paris Under Eiffel Tornert, Stockholm, 1889) quoted in Cate, The Eiffel Tower: A Tour de Force, 56. Kaufman, Paris of To-day, 287-292. Edmond de Goncourt, Journal des Goncourt, Vol. 8, 1889-91, Bibliotheque Charpentier, Paris, 1895, 50-51, 65-66 quoted in Cate, The Eiffel Tower, A Tour de Force, 51. Goncourt, Journal des Goncourt, 50-51, 65-66. Kaufman, Paris of To-day, 56. Joris Karl Huysmans, Against Nature, trans. Robert Baldrick, Harmondsworth, England: Penguin Books, 1959, 33-35. Bruno Latour, “Give me a Laboratory and I will raise the World,” in Science Observed: Perspectives on the Social Study of Science, K. Knorr-Cetina and M. J. Mulkay, London; Beverly Hills: Sage Publications, 1983, 141-170. Victor Hugo quoted in David Harvey, Paris, Capital of Modernity, New York: Routledge, 2003, 255. Vanessa R. Schwartz, Modern France: A Very Short Introduction, Oxford; New York: Oxford University Press, 2011, 100. David N. Livingstone and Charles W. J Withers, Geographies of Nineteenth-Century Science. Chicago; London: University of Chicago Press, 2011, 10. Reading on behalf of Gustave Eiffel, Max de Nansouty, “Centenaire de 1789,” Le Genie Civil, Vol. VI, No. 7, December 13, 1884, 108-109. Gustave Eiffel, Travaux scientifiques exécutés à la tour de 300 mètres, de 1889 à 1900, Paris: L. Maretheux, 1900. Pierre Janssen, “Un observatoire au Mont-Blanc,” paper delivered during the annual meeting of the French Institute, Academy of Sciences on Monday, December 19, 1892, Paris, 1893, 16, quoted in Henri Loyrette, Gustave Eiffel, 205. Gustave Eiffel, Recherches expérimentales sur la résistance de l'air exécutées à la tour Eiffel, Paris: L. Maretheux, 1907. Gustave Eiffel, Biographie, Vol. 3, page 1, translated and quoted in Loyrette, Gustave Eiffel, 206. John Anderson, A History of Aerodynamics: And Its Impact on Flying Machines, Cambridge; New York: Cambridge University Press, 1997, 273. Gustave Eiffel, La résistance de l'air et l'aviation; expériences effectuées au Laboratoire du Champ-de-Mars, Paris: H. Dunod et E. Pinat, 1910. Harriss, The Tallest Tower, 140.